Before and after illustration of an arm liftAt Aesthetic Surgical Associates, Dr. Stephen E. Metzinger can treat hanging or sagging skin on the upper arms with an arm lift in Metairie, LA. Also known as brachioplasty, this surgical procedure can eliminate loose and excess skin due to significant weight loss or the natural aging process and can result in slimmer, firmer, younger-looking arms. Dr. Metzger is a board-certified plastic surgeon who uses the most advanced procedures and techniques to safely rejuvenate his patients' arms with beautiful results. Potential candidates are patients with loose or hanging skin on their upper arms. This skin, which may contain pockets of stubborn fat, is resistant to change through diet and exercise. If you have lost a significant amount of weight and your skin has stretched beyond its capacity to retract, surgery is the only way to tighten it. Post-weight-loss patients may also benefit from a thigh lift or comprehensive body lift. If you have not yet reached your weight-loss goals, you should postpone your arm lift procedure, as changes in weight can affect your results. Candidates for an arm lift must also have adequate skin elasticity, be in good general health, and not have any medical conditions that could impair healing. During your initial consultation, Dr. Metzinger will evaluate your candidacy and discuss your aesthetic goals. He will examine your skin quality and the shape of your arms, and he may observe your arm movements to gain a clear picture of your needs. Dr. Metzinger will answer all your questions and explain the outcome you can expect from your procedure. Arms lifts are typically performed on an outpatient basis, and they take one to two hours per arm to complete. 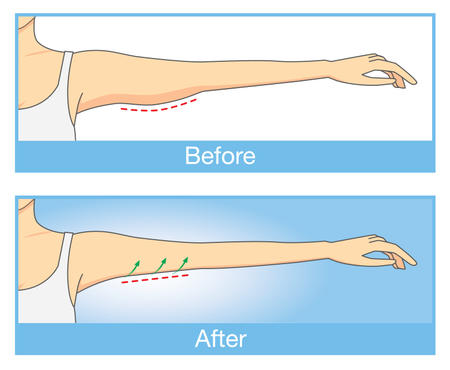 The standard incision for a traditional upper arm lift goes from the armpit to the elbow. Dr. Metzinger will vary the pattern and size of the incision based on the amount of skin to be removed. He will then trim away excess skin and tighten the underlying tissues. Removal of excess fat can be accomplished through direct excision or liposuction, depending on what is best for the patient. Patients who need less extensive arm reshaping from moderate weight loss or from aging may be candidates for a minimal incision arm lift, also called a mini arm lift. With this technique, the incision is much smaller and can be placed in the armpit. Both techniques remove excess skin and fat to create a more contoured shape. Arm lift surgery typically requires a recovery period of a few weeks. Dr. Metzinger can give you a prescription to address any pain, which you may have for several days after surgery. Some swelling and bruising is also normal and may last for two to three weeks. Although light exercise like walking is important and promotes healing, you should avoid heavy exercise and lifting for six weeks. Most patients return to work within several days and resume most of their normal activities in about two weeks. Your arms will be slimmer and lighter immediately after surgery. However, you will need to wait for swelling to dissipate before seeing the results of your arm lift. After recovery, your arms should have significantly improved definition, and results will be long-lasting as long as you maintain good physical fitness and a stable weight. As with any surgery, an arm lift carries certain risks, including infection, bleeding, and anesthesia risks. Your safety is Dr. Metzinger's highest priority, and he has an excellent safety record. Dr. Metzinger is a triple-board-certified plastic surgeon, and he works only with board-certified anesthesiologists. In addition to the aesthetic improvements, benefits of arm lift surgery include lighter, more comfortable arms. Many patients enjoy having more clothing options, and feeling much more comfortable exposing their arms. You may also experience improved self-esteem and confidence. Consistent feedback from our patients reflects Dr. Metzger’s skill and genuine care, as well as the quality of the outstanding staff at our plastic surgery practice. If you would like to schedule a consultation with Dr. Metzinger for an arm lift, or for any other body contouring procedure, please contact us today.